ATTENTION: ALL ORDERS ARE SHIPPED WITHIN 24 HOURS !!! We have been notified by some customers that Amazon is stating that the delivery time is 3+ weeks, that is NOT TRUE, we ship orders 6 days a week. Increased co2 The benefits of increased carbon dioxide levels within a greenhouse are widely accepted and understood, and include earlier flowering, higher yields, improved stem strength, and larger flowers. No set up or maintenance EZ CO2 is far less costly than tanks and generators and is incredibly simple to use. Just place it and leave it! It's that simple. You'll reap the benefits of increased CO2 PPM without any of the work or hassle of the other methods. MEDIUM = MORE CO2 We've increased the amount of medium in our bags, compared to others on the market, so you get more CO2 for your money. Simple and uncomplicated EZ CO2 gives off no odors or heat, and is completely self-sustained. It's already giving off CO2 the moment you buy it, and it continues to produce CO2 for the next 6-8 months. 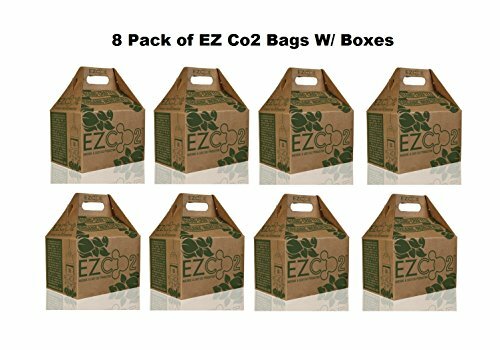 ABOUT EZ CO2 is a natural, safe, and inexpensive way of providing your plants with carbon dioxide (CO2). CO2 tanks and generators can be expensive and time consuming, but EZ CO2 requires no set up or maintenance and is easy on your budget! If you have any questions about this product by EZ CO2, contact us by completing and submitting the form below. If you are looking for a specif part number, please include it with your message.